United States Navy Seabees from the segregated 17th Special Naval Construction Battalion await orders to move up to the southeastern promontory of Peleliu (Ngarmoked Island, actually a peninsula connected to Peleliu by a bridge) to act as stretcher bearers for the 7th Marines. 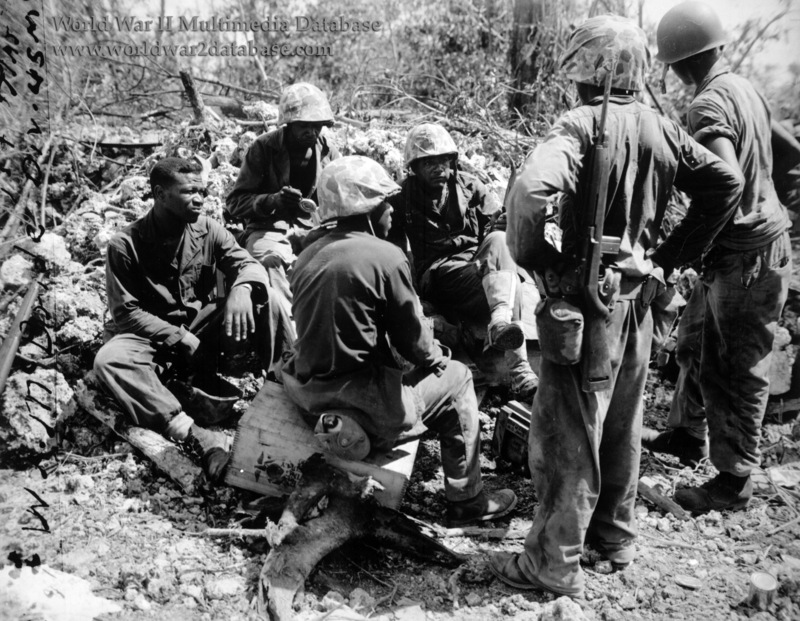 In the first 4 days of the Peleliu campaign, the 7th Marines, less the 2nd Battalion held in reserve, killed 2,609 Japanese while suffering 47 dead, 414 wounded, and 36 missing in action. The Imperial Japanese Army's veteran 2nd Battalion of the 15th Regiment was completely annihilated, many jumping into the sea or shooting themselves to avoid capture. So many bodies crowded Ngarmoked that African-American Marines of the 16th Field Depot (the attached segregated units 7th Ammunition Company and 11th Depot Company) and the 17th Special Naval Construction Battalion (CBs or Seabees, segregated stevedore units for unloading ships) were detailed to bury the dead and retrieve the wounded. Corporal Edward Andrusko, I Company, 3rd Battalion, 7th Marines, tried to find reinforcements and stretcher bearers. He later wrote, "Our trio set out to find help. We visited several headquarters command posts, and various rear special units, seeking assistance, but none was available. Our Top Sergeant tried to influence his friends to get our company help, but there just wasn't any. A young black American sergeant overheard our plight, walked up and said, 'I heard you all were looking for troop replacements or supply help. We are from the Marine Ammunition Depot Company and have had some infantry training.' Our Top Sergeant looked a little stunned and speechless. The races were so completely segregated during this era that we had no idea who these black servicemen were. The Top cleared his throat and asked, 'Who are you? Are you Army, Navy, Seabees, or what?' 'Top Sergeant, I am a U. S. Marine Sergeant. My men on this beach are all US Marines! 'Our Top Sergeant appeared very puzzled. How could he bring in an all-black unit to rescue wounded members of a Line company that was part of the famous 'All-White' First Marine Division? This division was heavily complemented with white Southern officers and men, home based at New River, North Carolina, and 'the pride of the South.' Our perplexed Top Sergeant tried to discourage the volunteers from coming, stating they were not trained or qualified for the terror of this battle. By now, the volunteers had heavily armed themselves and lined up behind their Sergeant who insisted we lead the way to the front lines. I heard our seasoned Top Sergeant say, 'Well, don't say I didn't warn you!' When we reached our mauled company area, it looked like General Custer's Last Stand. The Top Sergeant came upon our company's new replacement officer in command and said, 'Sir, I have a platoon of Black ...I mean a platoon of Marine volunteers who came to help.' The young new Commanding Officer said, 'Thank God. Thank you, men. Sergeant, take over. Get our wounded and dead out.' We gave covering fire and watched in awe as our gallant volunteers did their job. Some of these new men stoically held a casualty stretcher gently in one hand as 'true angels of mercy'. Then, when necessary, they would fire an automatic weapon with the other hand, while breaking through the surrounding enemy. One badly wounded white Southerner said, 'I felt like I was saved by the Black Angels sent by God. Thank you. Thank you all!'"